All summer long the Indy blogs have been abuzz about one thing: tree houses. As a resident of Hamilton County, I get the awesome privilege of being close to three of the best. My summer has been spent in the trees with my children, which is good because that shade sure does help when it gets pretty hot out. So have you had a chance to check out the newest experiences at Strawtown Koteewi and Conner Prairie? Koteewi Aerial Adventure Treetop Trails is pretty breath taking. It’s the kind of thing you’d expect to see people do on a really cool and expensive vacation in Costa Rica, except it&apos;s right here in Hamilton County, Indiana. 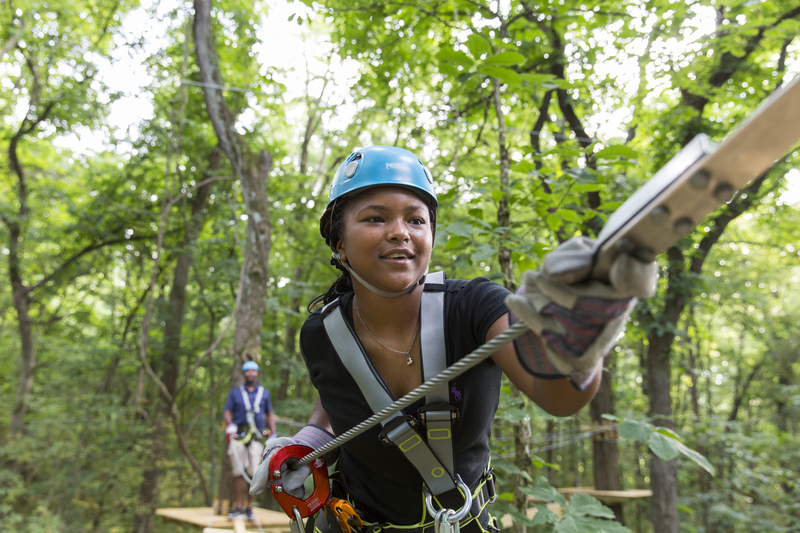 Featuring a zip line obstacle course, this tree adventure has a decidedly grown-up flair. However, children seven and over are welcome to participate with a parent or guardian, but since most of my children are under seven, I checked this one out solo. I’m not really afraid of heights, but looking out over the treetops here definitely gave me a bit of a scare. I’ve done other zip lines before, but this one takes you directly through the trees. My wife always tells me she pictures herself crashing into stuff on rides like this and that’s definitely the feeling I had. Of course, it’s completely safe and well planned out, but it’s for sure a dare devil adventure. 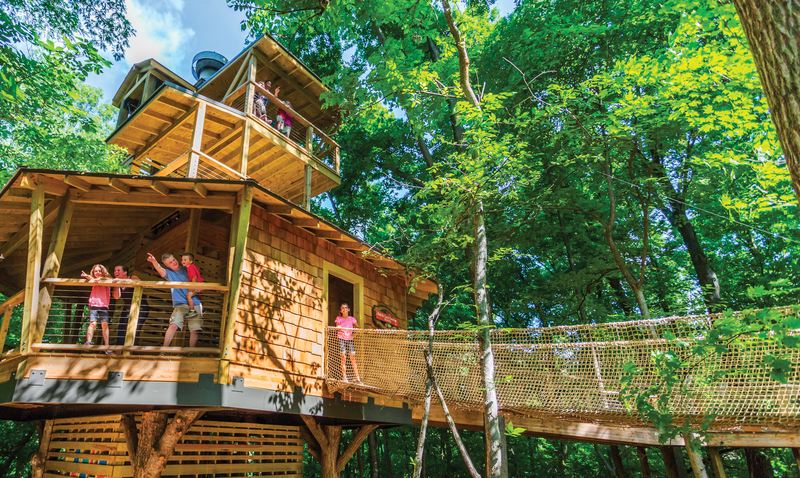 The second amazing offering is Conner Prairie’s Treetop Outpost, which opened July 1. Since then, I basically haven&apos;t seen my wife or children. This multilevel adventure really could be an attraction all on its own and it&apos;s entertaining for children of all ages. My youngest two spend the vast majority of their time in the sand boxes, digging up pottery, bones and all other types of unusual objects. In that same area, my older children used the life sized Lincoln logs to build a wall that would make any much-maligned presidential candidate proud. That area can easily keep my kid’s busy for more than an hour. Just when I think they will be ready to move on to the next part of the museum, they realize they haven&apos;t actually even been in the treehouse itself! Four floors of awesome for them to explore so as a lazy dad I like to hang out on the main level where there are communication tubes to each level. My children will shout down to me from each floor and I can keep an ear on them while I play with the magnifying camera. My favorite part though is probably the lower level, which leads out to a nature trail. On that level is a little library where I like to sit with my children in the retired seats from Bush Stadium, the former home of my Indianapolis Indians, and read aloud about all the nature around us. Between these two and the incredible tree houses at Flat Fork Creek Park, Hamilton County is the place to be among the trees. As fall starts to turn the leaves into a rush of color, make sure you get out on a limb and climb some of our amazing trees. Remember to tag us on Instagram by tagging @VisitHamiltonCo and #VisitHC.